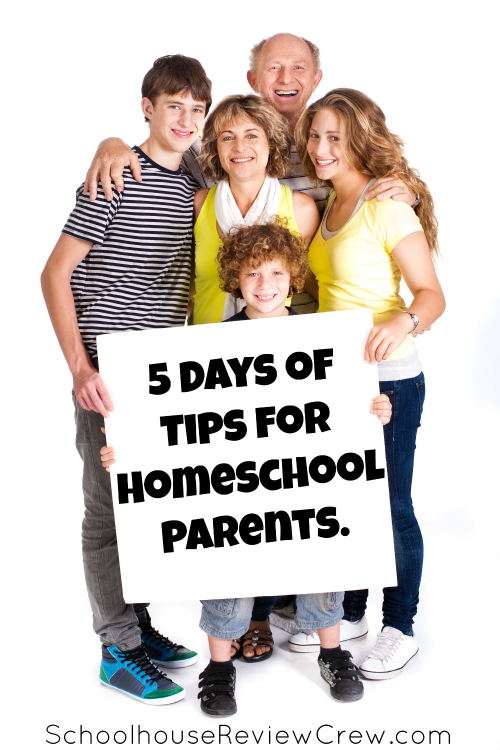 Welcome to the first day of Tips For Homeschooling Parents. I hope you will join us every day this week for tips on all manner of things related to homeschooling. I think most homeschooling parents often wonder how on earth they will ever fit everything in. We spend many hours pondering what education means to us, how we foresee that with our children and what tools we will actually use to help guide us along this path. If you are anything like me most years you will have a list a mile long of all the things you would like to cover. All the topics you'd love to introduce your children too. All the experiences you wish you could take. Then the day to day reality sets in and you quickly realise that on some, if not many days it is all you can do just to get through the basics of the 3r's. I've always gathered my children together to read to them every morning, or at least we try to do this every morning. One morning, quite some time ago it dawned on me that I could be using that time to our advantage. Don't get me wrong, reading 'for fun' books is definitely an important part of our day but what if I could also add in other learning opportunities into the time window. Slowly, slowly I began including books from history, biographies, books about art and artists. Science books and books relating to any unit we may have been working on. Whilst I read the kids draw and color. Sometimes their drawings will reflect the readings, other times we will practice our still life sketching skills. Right now our Morning Basket routine consists of all of us having something we are reading aloud. My youngest simply shares out loud simple books that he can already read. This is purely to help build fluency and his confidence with reading out loud. My older two children choose a chapter book that they would like to read to us. I also read aloud from a chapter book of my choosing. Generally that takes about 20 or so minutes. We have also begun working our way through the Logic of English program. I could do this individually with each of the children but I've chosen to use it as part of our morning basket routine because it is a program that we can utilise together at varying levels. We spend around 15 to 20 minutes on LOE each morning. Currently we are looking at some famous Artists. Again we spend around 20 minutes reading, admiring and discussing art work, drawing and notebooking. This is the area of our morning basket where I also sneak in some copywork, which at the moment is related to our artist study. I try to keep the morning basket portion of the day to around one hour. As we complete a book or begin to tire of a topic we change it up and include something different into the routine. At some point during the hour, generally when I notice that my 7 year old needs a break, we have been trying to work on perfecting our diaphragmatic breathing and a couple of simple yoga poses. Even on busy days if all we can fit in is our morning basket than I know we have gathered together and have exercised both our minds and our bodies. I love all of the little extra nuggets I have been able to fit into our year simply by including them in our morning basket. 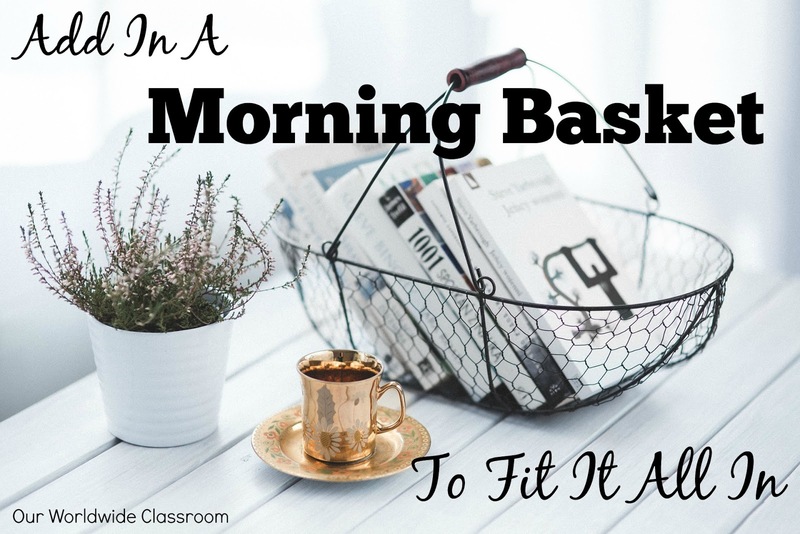 So my first tip for the week is to get started on a morning basket. Keep it simple, if you aren't already reading aloud first thing in the morning, then begin with that and once it is routine, little by little add in smaller pieces of 'something else' that you would like to share with your children. After the morning basket, we move into our independent work blocks and I'll try and touch more on those later in the week. From there it is lunch time and generally enthusiasm for the day is beginning to wane. This is where the 'do one more thing' tip comes into play. Once we've cleaned up from lunch we simply do one more thing. It might be science, history , geography, art, craft or even board games together or simply any other topic we haven't touched on during the earlier part of the day. But whatever it is both the kids and I know that it is only one more thing. 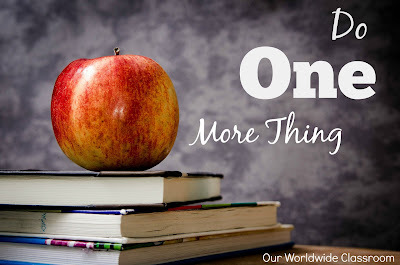 It is so easy to let the afternoons slip by and not do anything productive with them, but if you include the 'do one more thing' habit into your routine you'll quickly be surprised as to how much extra you can pack into the day and still have a large chunk of the afternoon for down time. We don't draw it out, this is generally the shortest part of our day, unless of course we are completely engrossed in what it is we are doing. Again, like with the morning basket, I rotate our 'do one more thing' topic so that we are touching on different areas each day. So my second tip for the week is to simply do one more thing after lunch. Keep it simple, you might even like to start with things board games, documentaries and crafts. Once it becomes routine then the skies the limit with what you may add in to that part of the day. This is great! I love the morning basket idea. We always do our reading first thing in the morning, but maybe I will start adding in other books too.